headache for the mods. My heart is pounding a little fast and hard just thinking about that possibility. Methinks 'The Mysterious Self-Locking Threads' would be a forum disaster fit only for a @Starr Shine? story. Maybe the forum is haunted by the ghost of John playing one of his many pranks. This could explain a bunch of a strange forum glitches like the moderation sickness or the swapping . .
^ I've said before that I also agree with RN. I have no problem with the mods, I think they're all darlings and lovely people but I do think this was some kind of 'lock while they're not looking' decision and not some bizarre glitch of the forum*. If it was a glitch then it should be studied as some kind of incredible AI that can deduce when a thread (e.g. about Halloween or Christmas) is more likely to be reopened than a thread on Journey for example. However, I will wait for Joe to get back to us. Let it be known I have no problem with Joe either but I do hope we get an explanation as to why half of the threads have been mysteriously locked without prior-warning despite the fact we were promised that. If it actually was some miraculous glitch then I apologise for any comments I have previously made. *And by this, I of course believe the mods in that they didn't know they was going to happen the way that it did. I don't think AG, mmm or Zig is secretly plotting behind our backs to rid ATN of its many threads. I don't pay attention to the use of smileys much and considering some of what has been posted over the last couple of days it didn't seem that obvious a joke. Plus I was working and trying to fit in all this with that. My bad. As said before, after 8 years and getting to know Joe I do not believe that he would suddenly change and act this way deliberately, especially after all the discussions on here and in email in regards to how the ATN threads would be handled going forward. I don't know how the threads have been locked but if its by groups, pages or some other means it's perfectly possible that some threads have been caught up that should not have been and Joe has not noticed. As a mod I always go with the benefit of the doubt, adding in everything I know about Joe I have even more reason to give him that. That isn't out of blind loyalty, it's out of getting to know him as a person and runner of this forum and site. I find it a little sad others think differently. On another note, I have a notification that one of my posts has been moved to 'It Was 50 Years Ago Today' yet my post was made on the 8th January 2012 and the last post in that thread was in August 2012. Seems a strange move considering they were almost 6 years ago. Edit: I just saw the discussion about a move in the 'Mother Superior' thread so ignore. Um, hello. I've been away for a few days and didn't know this was blowing up. Sorry. I locked those threads on Thursday. I started on the final page (27), working backwards and locking any that hadn't had a contribution in many years. I got a bit carried away – I wasn't feeling well and probably should have waited till I was thinking a bit more clearly. I certainly should have let people know before I got started. When it was done I had to rush off and pick my kids up, then life got in the way, then it slipped my mind. That was a mistake and I apologise. It seems fairly certain that we'll prevent new threads from being created in ATN , to avoid the free-for-all that we currently have ("What are you whistling right now? "; "What's your favourite colour" etc). But I would like people to chime in with suggestions on what else from the current crop we should keep. I proposed a core set of six threads in my first post here, but if people have a burning desire for more please speak up and say which ones. I originally said I'd be making changes in a week, but I've left it open longer because I wanted to hear people's thoughts. Thanks to those who have engaged in this. I'm still trying to come up with a way of presenting non-Beatles music in a more manageable way. Then there's the question of whether we keep other arts (books, films etc). And then where do you draw the line? Why not continue the sports discussions? And all the rest? This is really tricky to get right, and I'm genuinely open to suggestions as long as they're polite and non-confrontational. Honestly, if more people had bothered to reply with specific suggestions I might have kept more of the threads open, but very few people did. Other than that, we'd like this to be a Beatles forum first and foremost. So in a week or so [sic], all the other ATN threads will be moved to a new archive section, locked and made read-only. I've put a stop to new threads from being created in the ATN section. You can still reply to discussions that are already there, you just cannot start brand new ones. The rest of the forum will remain fully open. I realise this won't be popular, but it follows a lot of the discussions that have been going on here. New ATN threads don't get started all that often, so it shouldn't really make much difference, but I didn't want someone to start a chat about something that would have to get locked/migrated/merged at a later date. I thought that was clear enough, but evidently not. The above statement explains that the creation of new threads was being stopped. "The rest of the forum will remain fully open" refers to the non-ATN parts of the forum, ie the thread-restriction would be ATN -only. You misquoted this as "The rest of [ATN ] will remain fully open", but [ATN ] changes the meaning of what I said. I also wasn't referring to locking threads in that particular comment. We had dozens of threads on individual bands. I think we had at least three or four on Queen alone (my fault for not merging/deleting them at the time, but never mind). There were also multiple Bowie, Dylan and Pink Floyd threads, other ones on Buddy Holly, Mac DeMarco, Harry Nilsson, Kendrick Lamar, Flaming Lips, Green Day, Phil Collins, Belle and Sebastian, the Lovin' Spoonful, Neil Young, Tom Petty, Rush, Jonas Brothers, Frank Sinatra, Billy Joel, and many others. I haven't got on to sport, but imagine there being threads on all of those too (or go looking for them if you want). TV? There's the Simpsons, Futurama, Pawn Stars, American Idol, Stranger Things, Doctor Who etc. Then there were the miscellaneous ones on DVD-A authoring software, cute animals, insomnia, fixing Fender amps, the MPAA, Photoshop, and so on. As I've mentioned often before, I think other forums (Facebook, subreddits, the pub, wherever) are much better for this sort of thing. Most of the locked threads hadn't been added to in many months or even many years. I also wanted to consolidate the music threads, to allow a place for discussion but in a less scattershot way. To that end, I purposefully left open threads on musical genres, eg early Rock 'N' Roll , country music. I'm not planning to lock any of those (and I promise I will let people know before doing anything else like this). I left Prince and Led Zep open, among others, because they'd been recently active. I was intending to wait until they too died down before locking them. I left some other threads open because I wasn't sure what to do with them, so this whole process isn't final (ie some might be reopened, others might get closed). As for Bowie, yes I'd love to chat about him on my own forum, because I love him as much as I love the Beatles, but I'm not going to be a hypocrite and leave it open when I'm closing others. Unless… help me here. Tell me why certain locked threads should be reopened. Not just because you like them, because we're a broad church with a huge range of individual interests. But how might a discussion on X make this forum better, and how is it impossible outside the currently-open places? Let me know here. It might be that we can leave some threads open for legacy's sake, but only for major artists (Dylan, Bowie, Prince, Led Zep), but not start new ones. Would that help? Then all other music chat can go into some dedicated genre threads, 'What are you listening to', or somewhere else that already exists. But… can I meekly make one request? We've got a seven-page discussion on which ATN threads to retain. If you want to defend any of them, can you please do it there? Otherwise we'll potentially have two discussions in parallel. I'm happy to debate the rights and wrongs of the way this was (mis)communicated and executed here, but otherwise let's keep this 'weird things' thread on topic. Sorry also to the mods for springing this on them. Really sorry. Thanks especially to MMM for assuming good intentions on my part, even when they were clearly evil. The guest number is broken, @Joe. I refuse to believe we've not had more than one guest on the forum at a time for weeks. AG and I did an experiment the other night where it was showing one guest and she asked me to close my always open tab. It didn't take the guest count down to none. Also, possibly connected, in actual threads, I keep finding the "Currently Browsing this Page" missing. This one may just be me, but I keep having some weird navigation jumps. I went to log in elsewhere earlier, pressed the button, and instead of logging it jumped to The Albums index! I'll add that i've been having problems to log in via mobile+android+chrome... it worked fine with firefox, though. The issue is that when i press the logging button (after filling the username and password fields) it doesn't log in. It stays in the same page. Just quoted this in computer+chrome, it's working fine. And... first time I tried posting this it bounced me out saying I was out of time. Fingers crossed for this attempt. Ah, sorry @Ron Nasty. I get a ridiculous amount of spam, in the article comments and forum, and I put in a new filter which obviously needs some fine tuning. Are you still using Opera? Is it any better in a different browser? I'll whitelist your email address so hopefully that first thing shouldn't happen again. 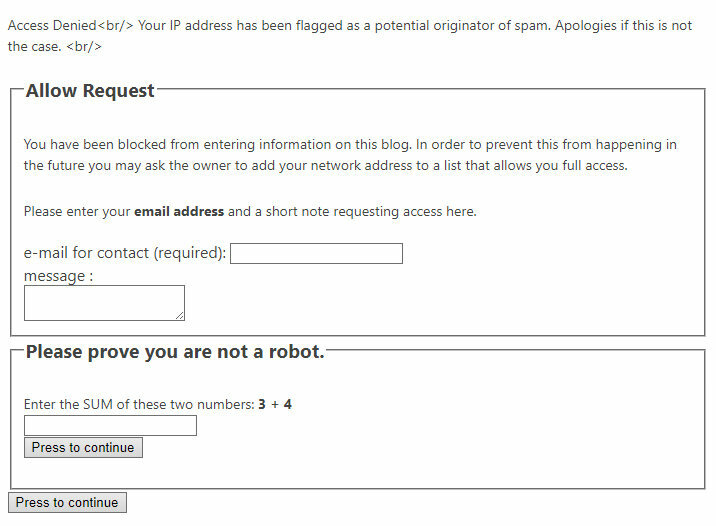 If it does please fill in the form, including your name, and I'll see if I can whitelist your IP address too. I'm not sure about the attachments. Again, please try a different browser first. I'll look into this second issue. A few months ago I combined a bunch of JS files to speed up the forum, but I'm not able to test every browser/OS combo. It might be that they disagreed with FF. What's your computer's OS? As for Android/Chrome, I'm on Oreo and just logged in successfully in Chrome incognito. Can you try again and see if the problem is still there? Are you logged in when you navigate to a different page? We've long had a weird login glitch where the un-logged-in page is cached, so when the page refreshes it still suggests that people need to log in. I'm not sure if that's what you're seeing here. Can we talk about ads? I know some of you have seen some weird/ugly/annoying stuff happening here recently, and it deserves an explanation. First of all, I know ads aren't great. Nobody likes them. But they do help keep this site free and to allow me to work on it, without which I'd probably have to shut it down. I'm more than familiar with the moral/philosophical debate around keeping the web free, versus exercising the right to turn ads off. If you're not using an adblocker, thanks, I appreciate it, as will other web publishers. I promise that if I ever win the lottery I will remove ads altogether. There have been some recent changes to ads, though. In May I started working with a company which does automated machine testing of ad placements, to try to get the most effective combinations and positions. They also draw on more partners to bid on the ad space, which theoretically will mean more money (and will allow me to continue writing and making great web stuff full time, rather than having to get a proper job – at the moment I'm not there yet). The testing takes some months to complete. Users (many more than the total active users on this forum) may either see the old version or a new permutation, chosen at random. The site itself will remain unchanged, but the ad placements might look odd or ugly for a while, until the ineffective ones are retired and the better ones remain. Sometimes it's likely to be awful, but that's part of the machine learning process. At the moment only 10% of users are part of the testing, so 90% of people are seeing the old version, but during much of May it was up to 50-50. I'm keeping it low at the moment to minimise disruption, but may change it again. 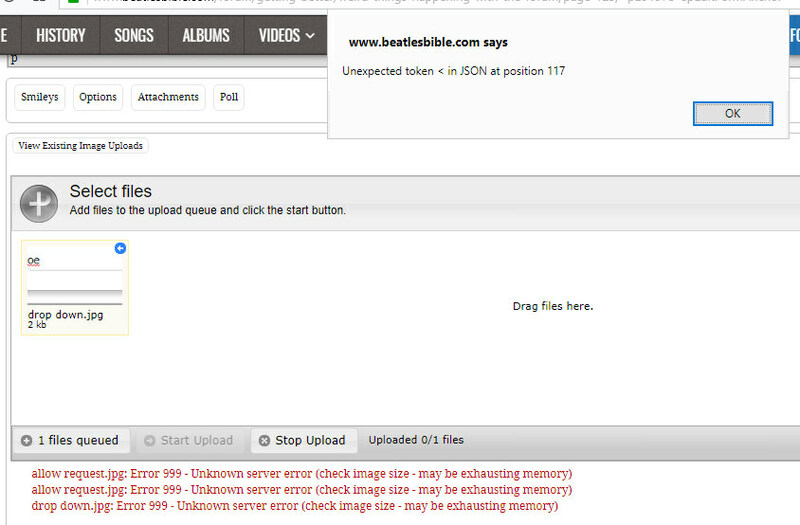 I want to prevent any popups or overlays from appearing, so if you do see any of those please do take a screengrab, and either post it here or email it to me (joe at beatlesbible dot com). If any ads are obscuring text/pics or login forms, that's obviously not great either. It might just be a temporary glitch during testing, but again if you see this happen please screenshot it and let me know. I'm more than happy to discuss this further if anyone wishes to do so. And obviously I'm sorry for any inconvenience. This is a quote in FF 59.0.2/macOS High Sierra. Seems to be OK. If it's a Windows issue I'm not sure I can fix it, as I don't have a PC. Now I remember why I wanted to talk about ads! To do the machine testing I had to run the website through a proxy service. It doesn't really need explaining in depth here, but it did have some unexpected consequences. I think the guests/currently browsing stats might well be related, in that the proxy for some reason doesn't allow proper logging of visitors. It doesn't really matter too much though. 2 Staff, 5 Members, 287 Guests. Not having good guest numbers can make our forum look bleak and lonely when *quickly* compared to other Beatles forums out there. We are still the coolest Beatles forum on the 'net. I'm not bothered with the number of people currently on or visiting the forum. I'd rather have a low number but a few decent posts than a high number of folk browsing but not posting or talking about the quality of beans - tho I'm sure a higher number of visitors means better income for Joe. However, I'm not one for saying words to fill the silence.